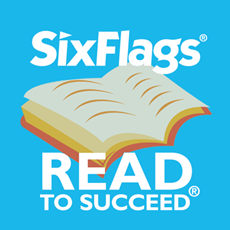 Through the Read to Succeed program, Six Flags wants to reward you for your hard work and dedication to literacy. All eligible students and teachers have the opportunity to earn free tickets to the park by completing six hours of recreational reading. All students in grades K through 6 are welcome to register and participate. Any student who completes six hours of reading outside of school will earn one admission ticket to the park for summer 2018. The eligible reading materials must be non-school-related, and can include picture books, newspapers, comic books, novels, and nonfiction. Parents and students will track the hours spent reading and submit a reading log to their classroom teacher. Teachers who register at the Six Flags Read to Succeed website and submit the completed reading hours of at least eight (8) students will also receive a free admission ticket to thank them for their efforts for encouraging and supporting the students. Registration is easy! Follow the easy step by step process in TeacherQuickTips. After your students have completed their 6 hours (or more!) of reading, log into this system again. At that time you'll need to enter at least eight (8) of your students’ names, grade and total reading hours. Please note: you do not need to enter the names of any of your students until they have completed their reading and turned in their sheets. All of your students who have completed their 6 hours (or more!) of reading must be logged by either the school coordinator or the classroom teacher by March 1, 2018 at 5pm Central Standard Time. Reading logs will NOT need to be mailed this year. However, teachers are asked save the completed Student Reading Logs for future reference. Read to Succeed was launched in 1985 to help support literacy, and has since donated millions of tickets to elementary school students and teachers. Their goal is to reward students for their hard work and give them a place to play when school is out for the summer. For teachers, it’s a way to thank them for educating and motivating students, and give them a place to relax during the summer. For more information, please contact Sheila Spurr or visit sixflags.com/readtosucceed.